Start early. Don't wait until December to start thinking about this. 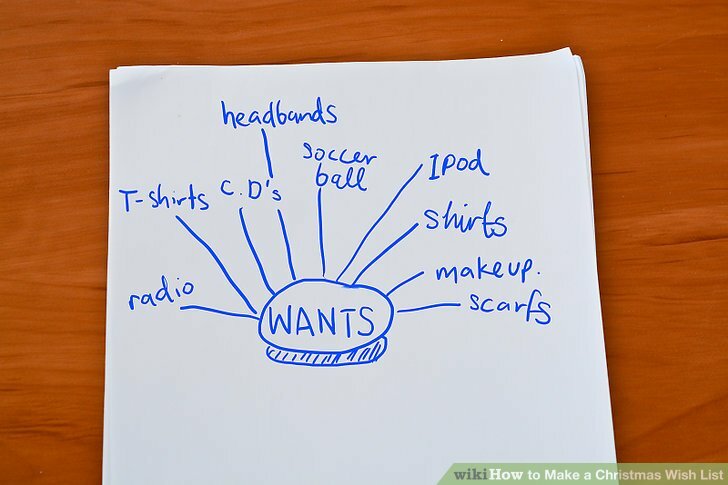 Whenever there is something that you want, but you can't get because you don't have enough money or your parents won't buy it for you, write it down. Before writing out your final list, write down everything that you want. That means every single thing you would want. Even if you only want it a little, write it down. Once you cannot think of anything else that you could possibly want, move on to step two. Think of your interests. Do you like sports? 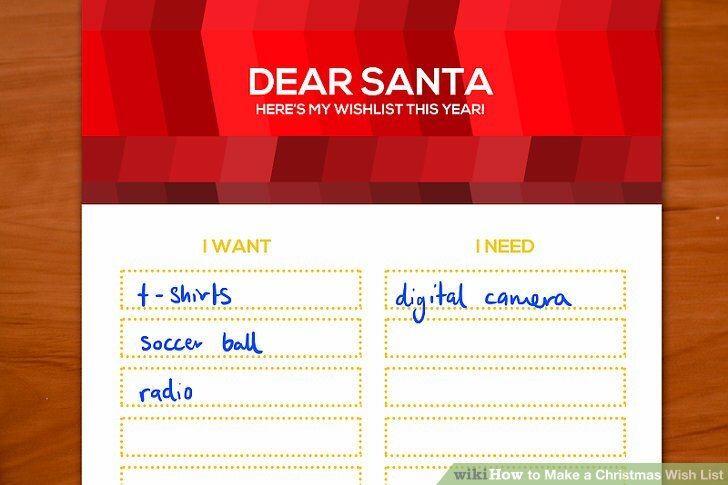 Then put a soccer ball, or some sort of sports equipment on your list. Do you love fashion? 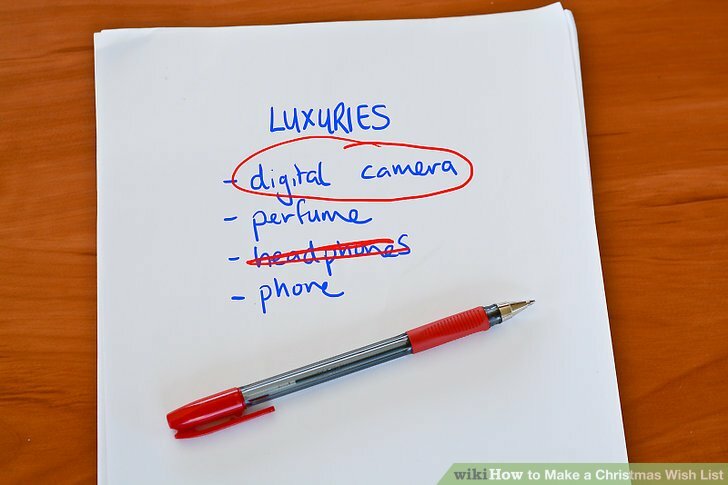 Then write down clothes, or be more specific (shirts, a scarf, etc.) If you like music, Put CDs, radio, or an iPod on your Christmas list. Think of what you need. Do you need some more T-shirts? If so, put them on your list. Or are you short on headbands and hair accessories? Put them on the list. Think about what you want. Do you so desperately want the latest makeup palette? If so, put that on your list. 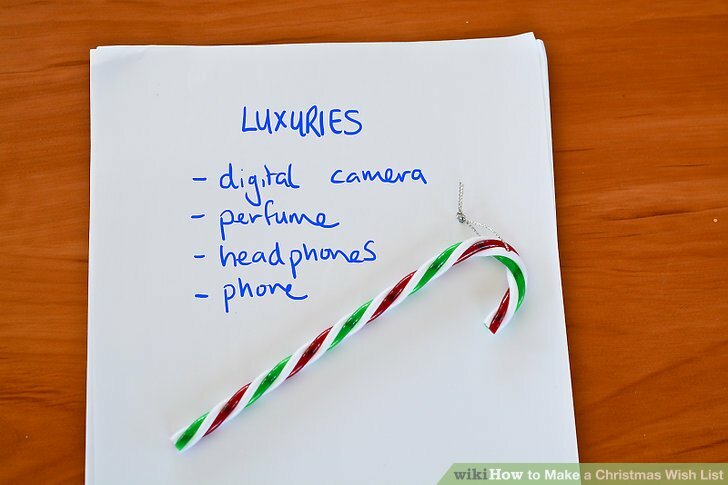 Think of luxuries. If you are a very practical person, think of things you would never buy for yourself, because you don't really need them, but that you would enjoy anyway. Let others treat you to those things. Get rid of things that you don't really want. Yes, this is the hardest part. Narrowing down the list. Try to shoot for around 10-20 items. 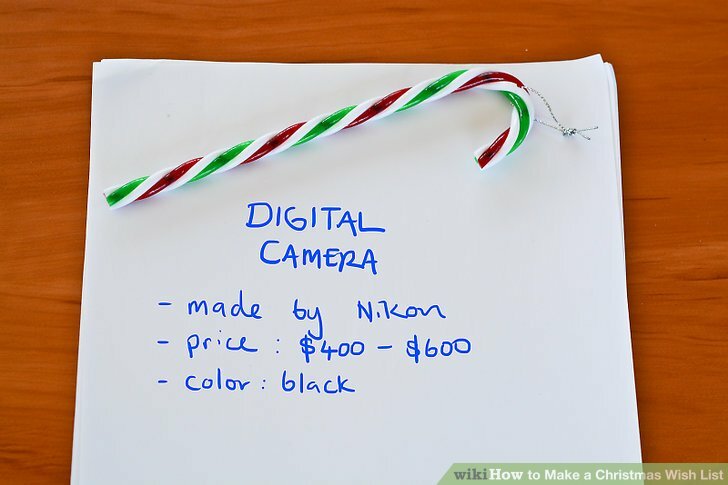 For example, let's say you have really wanted a digital camera for the past two years. That's something to keep on the list. But if you just recently wanted a new pair of headphones, and your old pair is just fine, that's something to cross off the list, because you don't really need or want it. A camera, however, is functional for taking pictures of things, and shooting videos. Research a bit on your items. Who makes the item? How much is it? Do you know any one who owns it? Could you describe it? are probably some of the questions you will hear. Go online and research what you want. Prices are always the best thing to look up first, then where this item can be obtained, and any other information. Pictures are great, so when your parents go Christmas shopping, they aren't stuck looking around for the present with the same name, they are just looking for the object that resembled the picture. Put together your list. Make it neat, colorful, and make sure to add some data about the item, like a picture and a price, and where you can buy it. This way, shopping for your gifts will not be too confusing. Also, if your mom/dad has to hop around to 10 stores just to buy two gifts, it will most likely tick them off. 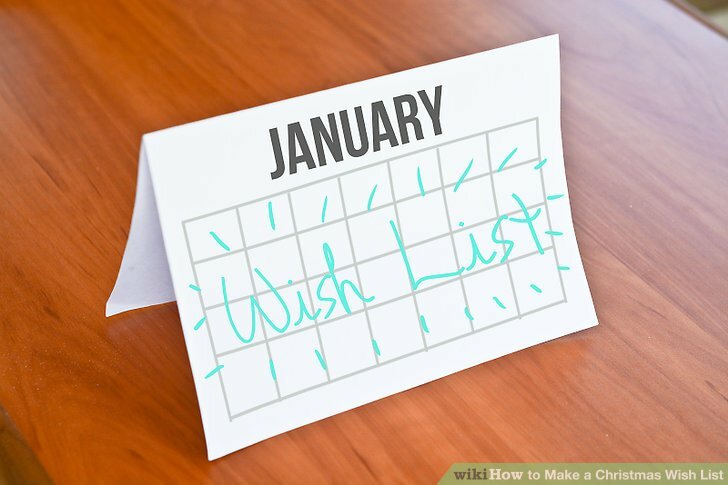 Try to make sure that they can buy most of your gifts at one or two stores. And, there is always online shopping from the comfort of your own home! Go over your list one last time before presenting it. Double-check your information. Are all the prices correct? Can you replace a brand name item with a cheaper but equally functional one? Is everything spelled correctly? 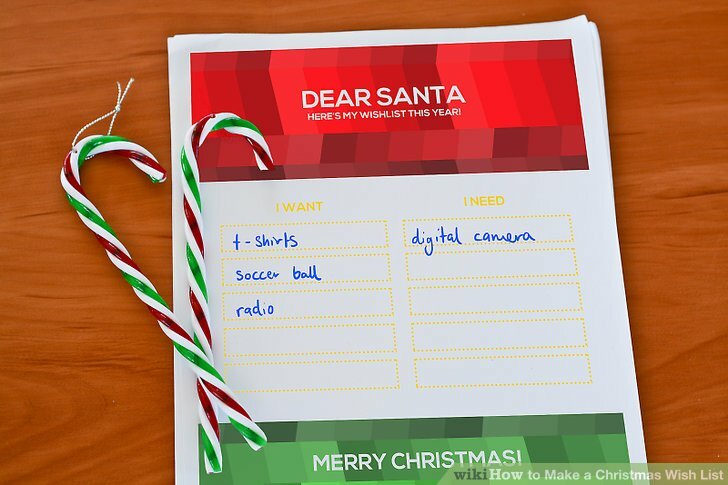 When you are ABSOLUTELY SURE everything is correct, present your list to your parents.